David Johnson Base - Season Ticket + Parallels 87 Cardinals ?? Josh Rosen Insert - Rookie of the Year Contenders + Parallels 6 Cardinals ?? Larry Fitzgerald Base - Season Ticket + Parallels 86 Cardinals ?? Calvin Ridley Insert - Rookie of the Year Contenders + Parallels 8 Falcons ?? Devonta Freeman Base - Season Ticket + Parallels 85 Falcons ?? Julio Jones Base - Season Ticket + Parallels 84 Falcons ?? Matt Ryan Base - Season Ticket + Parallels 83 Falcons ?? Joe Flacco Base - Season Ticket + Parallels 80 Ravens ?? Kenny Young Base - Rookie Ticket 99 Ravens ?? Lamar Jackson Insert - Rookie of the Year Contenders + Parallels 11 Ravens ?? Michael Crabtree Base - Season Ticket + Parallels 81 Ravens ?? Terrell Suggs Base - Season Ticket + Parallels 82 Ravens ?? Josh Allen Insert - Rookie of the Year Contenders + Parallels 5 Bills ?? Kelvin Benjamin Base - Season Ticket + Parallels 79 Bills ?? LeSean McCoy Base - Season Ticket + Parallels 78 Bills ?? Robert Foster Base - Rookie Ticket 98 Bills ?? Cam Newton Base - Season Ticket + Parallels 75 Panthers ?? Christian McCaffrey Base - Season Ticket + Parallels 76 Panthers ?? DJ Moore Insert - Rookie of the Year Contenders + Parallels 7 Panthers ?? Donte Jackson Base - Rookie Ticket 96 Panthers ?? Ian Thomas Base - Rookie Ticket 100 Panthers ?? Luke Kuechly Base - Season Ticket + Parallels 77 Panthers ?? Allen Robinson II Base - Season Ticket + Parallels 74 Bears ?? Anthony Miller Insert - Rookie of the Year Contenders + Parallels 17 Bears ?? Jordan Howard Base - Season Ticket + Parallels 73 Bears ?? Khalil Mack Base - Season Ticket + Parallels 24 Bears ?? Mitchell Trubisky Base - Season Ticket + Parallels 72 Bears ?? Roquan Smith Insert - Rookie of the Year Contenders + Parallels 18 Bears ?? A.J. Green Base - Season Ticket + Parallels 71 Bengals ?? Andy Dalton Base - Season Ticket + Parallels 70 Bengals ?? Jessie Bates Base - Rookie Ticket 93 Bengals ?? Antonio Callaway Base - Rookie Ticket 92 Browns ?? Baker Mayfield Insert - Rookie of the Year Contenders + Parallels 1 Browns ?? Genard Avery Base - Rookie Ticket 94 Browns ?? Jarvis Landry Base - Season Ticket + Parallels 69 Browns ?? Nick Chubb Insert - Rookie of the Year Contenders + Parallels 12 Browns ?? Amari Cooper Base - Season Ticket + Parallels 25 Cowboys ?? Dak Prescott Base - Season Ticket + Parallels 66 Cowboys ?? Emmitt Smith Auto - Franchise Honors 1 Cowboys ?? Ezekiel Elliott Base - Season Ticket + Parallels 67 Cowboys ?? Larry Brown Auto - Super Bowl Signatures 1 Cowboys ?? Michael Gallup Insert - Rookie of the Year Contenders + Parallels 22 Cowboys ?? Sean Lee Base - Season Ticket + Parallels 68 Cowboys ?? Bradley Chubb Insert - Rookie of the Year Contenders + Parallels 4 Broncos ?? Case Keenum Base - Season Ticket + Parallels 64 Broncos ?? Courtland Sutton Insert - Rookie of the Year Contenders + Parallels 14 Broncos ?? DaeSean Hamilton Insert - Rookie of the Year Contenders + Parallels 29 Broncos ?? Royce Freeman Insert - Rookie of the Year Contenders + Parallels 19 Broncos ?? Von Miller Base - Season Ticket + Parallels 65 Broncos ?? Kerryon Johnson Insert - Rookie of the Year Contenders + Parallels 25 Lions ?? Marvin Jones Jr. Base - Season Ticket + Parallels 63 Lions ?? Matthew Stafford Base - Season Ticket + Parallels 62 Lions ?? Aaron Rodgers Base - Season Ticket + Parallels 59 Packers ?? Davante Adams Base - Season Ticket + Parallels 60 Packers ?? Equanimeous St. Brown Base - Rookie Ticket 91 Packers ?? Jimmy Graham Base - Season Ticket + Parallels 61 Packers ?? DeAndre Hopkins Base - Season Ticket + Parallels 58 Texans ?? Deshaun Watson Base - Season Ticket + Parallels 56 Texans ?? J.J. Watt Base - Season Ticket + Parallels 57 Texans ?? Keke Coutee Insert - Rookie of the Year Contenders + Parallels 23 Texans ?? Andrew Luck Base - Season Ticket + Parallels 55 Colts ?? Nyheim Hines Insert - Rookie of the Year Contenders + Parallels 24 Colts ?? T.Y. Hilton Base - Season Ticket + Parallels 54 Colts ?? Blake Bortles Base - Season Ticket + Parallels 51 Jaguars ?? DJ Chark Jr. Insert - Rookie of the Year Contenders + Parallels 26 Jaguars ?? Jalen Ramsey Base - Season Ticket + Parallels 52 Jaguars ?? Leonard Fournette Base - Season Ticket + Parallels 53 Jaguars ?? Kareem Hunt Base - Season Ticket + Parallels 50 Chiefs ?? 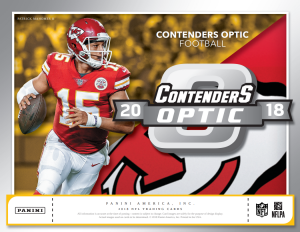 Patrick Mahomes II Base - Season Ticket + Parallels 48 Chiefs ?? Tyreek Hill Base - Season Ticket + Parallels 49 Chiefs ?? Joey Bosa Base - Season Ticket + Parallels 47 Chargers ?? Melvin Gordon III Base - Season Ticket + Parallels 46 Chargers ?? Philip Rivers Base - Season Ticket + Parallels 45 Chargers ?? Aaron Donald Base - Season Ticket + Parallels 44 Rams ?? Brandin Cooks Base - Season Ticket + Parallels 88 Rams ?? Jared Goff Base - Season Ticket + Parallels 42 Rams ?? Todd Gurley II Base - Season Ticket + Parallels 43 Rams ?? Kalen Ballage Insert - Rookie of the Year Contenders + Parallels 16 Dolphins ?? Kenyan Drake Base - Season Ticket + Parallels 41 Dolphins ?? Minkah Fitzpatrick Insert - Rookie of the Year Contenders + Parallels 30 Dolphins ?? Ryan Tannehill Base - Season Ticket + Parallels 40 Dolphins ?? Adam Thielen Base - Season Ticket + Parallels 38 Vikings ?? Kirk Cousins Base - Season Ticket + Parallels 37 Vikings ?? Mike Boone Base - Rookie Ticket 97 Vikings ?? Stefon Diggs Base - Season Ticket + Parallels 39 Vikings ?? Ja'whaun Bentley Base - Rookie Ticket 95 Patriots ?? Josh Gordon Base - Season Ticket + Parallels 90 Patriots ?? Julian Edelman Base - Season Ticket + Parallels 36 Patriots ?? Rob Gronkowski Base - Season Ticket + Parallels 35 Patriots ?? Sony Michel Insert - Rookie of the Year Contenders + Parallels 10 Patriots ?? Tom Brady Base - Season Ticket + Parallels 34 Patriots ?? Alvin Kamara Base - Season Ticket + Parallels 33 Saints ?? Drew Brees Base - Season Ticket + Parallels 31 Saints ?? Michael Thomas Base - Season Ticket + Parallels 32 Saints ?? Tre'Quan Smith Insert - Rookie of the Year Contenders + Parallels 27 Saints ?? 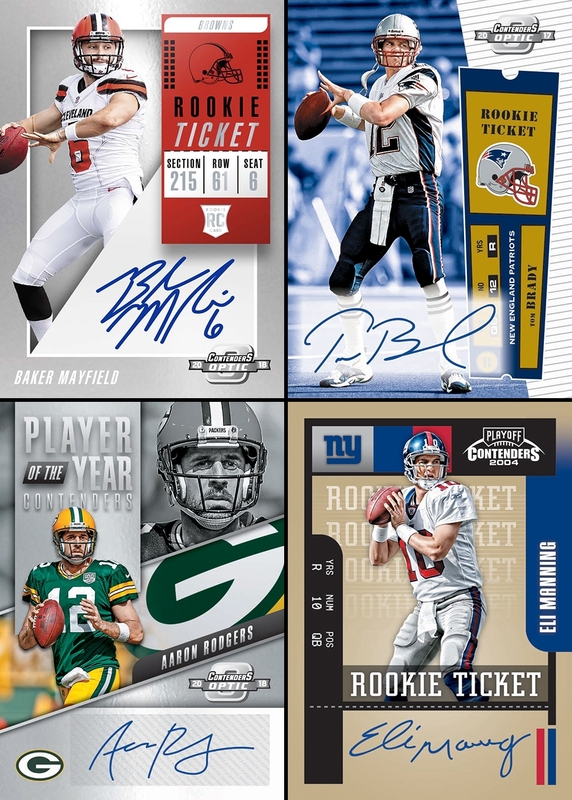 Eli Manning Base - Season Ticket + Parallels 29 Giants ?? Odell Beckham Jr. Base - Season Ticket + Parallels 30 Giants ?? Saquon Barkley Insert - Rookie of the Year Contenders + Parallels 2 Giants ?? Don Maynard Auto - Super Bowl Signatures 2 Jets ?? Jamal Adams Base - Season Ticket + Parallels 28 Jets ?? Robby Anderson Base - Season Ticket + Parallels 27 Jets ?? Sam Darnold Insert - Rookie of the Year Contenders + Parallels 3 Jets ?? Derek Carr Base - Season Ticket + Parallels 23 Raiders ?? Jordy Nelson Base - Season Ticket + Parallels 26 Raiders ?? Alshon Jeffery Base - Season Ticket + Parallels 21 Eagles ?? Carson Wentz Base - Season Ticket + Parallels 20 Eagles ?? Jay Ajayi Base - Season Ticket + Parallels 22 Eagles ?? Zach Ertz Base - Season Ticket + Parallels 89 Eagles ?? Antonio Brown Base - Season Ticket + Parallels 17 Steelers ?? Ben Roethlisberger Base - Season Ticket + Parallels 19 Steelers ?? James Conner Base - Season Ticket + Parallels 16 Steelers ?? James Washington Insert - Rookie of the Year Contenders + Parallels 21 Steelers ?? Jaylen Samuels Insert - Rookie of the Year Contenders + Parallels 28 Steelers ?? JuJu Smith-Schuster Base - Season Ticket + Parallels 18 Steelers ?? Mason Rudolph Insert - Rookie of the Year Contenders + Parallels 20 Steelers ?? Dante Pettis Insert - Rookie of the Year Contenders + Parallels 15 49ers ?? Jimmy Garoppolo Base - Season Ticket + Parallels 13 49ers ?? Marquise Goodwin Base - Season Ticket + Parallels 15 49ers ?? Richard Sherman Base - Season Ticket + Parallels 14 49ers ?? Doug Baldwin Base - Season Ticket + Parallels 11 Seahawks ?? Earl Thomas III Base - Season Ticket + Parallels 12 Seahawks ?? Rashaad Penny Insert - Rookie of the Year Contenders + Parallels 9 Seahawks ?? Russell Wilson Base - Season Ticket + Parallels 10 Seahawks ?? Gerald McCoy Base - Season Ticket + Parallels 9 Buccaneers ?? Jameis Winston Base - Season Ticket + Parallels 7 Buccaneers ?? Mike Evans Base - Season Ticket + Parallels 8 Buccaneers ?? Ronald Jones II Insert - Rookie of the Year Contenders + Parallels 13 Buccaneers ?? Corey Davis Base - Season Ticket + Parallels 5 Titans ?? Derrick Henry Base - Season Ticket + Parallels 6 Titans ?? Marcus Mariota Base - Season Ticket + Parallels 4 Titans ?? Alex Smith Base - Season Ticket + Parallels 1 Redskins ?? Jordan Reed Base - Season Ticket + Parallels 3 Redskins ?? Josh Norman Base - Season Ticket + Parallels 2 Redskins ? ?